From the moment we take our first breath, we begin processing information. 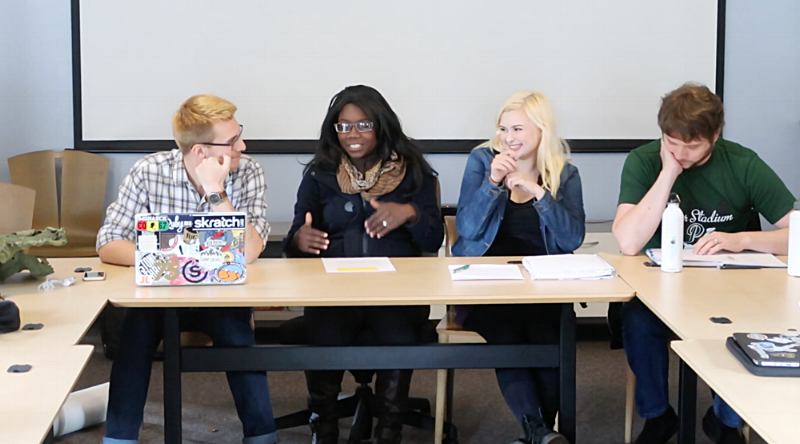 The tide of information today is often overwhelming, and in last semester's Engaging With Information course, students explored what it takes to understand all of this information and how to think about it meaningfully and critically. Asking myself “What is Information” always seems to end in a nihilistic crisis. I’ve always had a talent for going from panic level zero to one hundred in minutes, sometimes seconds. I start with what feels like a concrete problem or question and manage to end with the belief that it doesn’t matter and probably wasn’t even real to begin with. This brings me some sense of comfort - if none of it is real than none of it matters and I truly have nothing to worry about. However, settling on the idea that it’s fake rarely answers my original question and often creates more stress. If it’s fake, then why do I still feel confused? My struggle often lies in the ability to draw connections from my philosophical crisis down to something applicable and real. In Engaging with Information we, as a class, got better at asking the hard questions. We started class by discussing “What is information?’ and wondered if you could call everything information. The we started to delve into more analytical questions. Often deceptively simple, the repetitive “why,” was a common theme. Why was this written? Why does this matter? What is the author’s bias and why is it significant? What are the implications and why should we care? We were exploring big ideas and expanding our perspectives the way a toddler explores the world for the first time and it’s easy to arrive at the same answer we heard as a kid: because somebody said so. When talking about museums I explored and discovered almost anything could be a museum. I compared a large history museum to a small independent art museum. When I started asking “What actually makes these museums?” I discovered: they both, independently, decided that they were. The only thing it really took to start a museum was to start a museum. There were optional hoops to jump through or associations you could join, but at it’s core all it took was the desire to share content with the public. I was so surprised at the simplicity of it all. When we think about museums often we think about a trustworthy, powerful organization that we visit to get information, but my experience showed me all it really took was determination. This means that museums might not be the authority on the topics that society often thinks they are, because you don’t have to be an expert to start a museum. 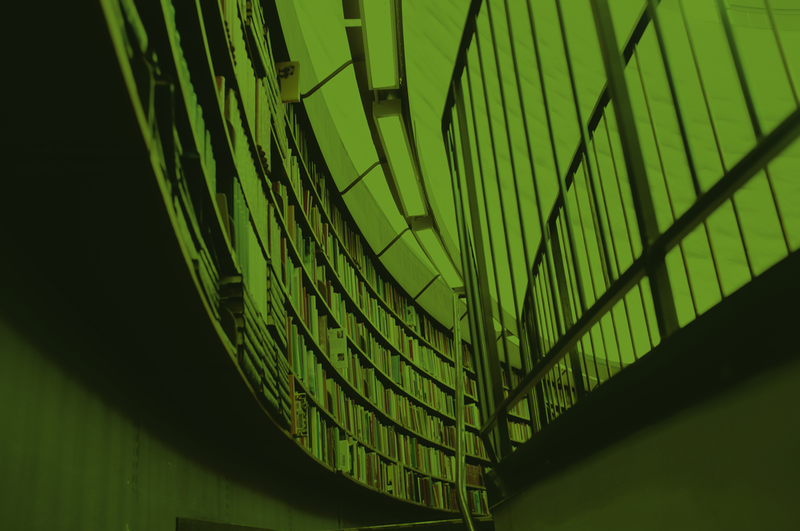 It also means that museums and information have the potential to be highly accessible sources for information, and may not be as elite and out of reach as they sometimes appear to be. When learning about wikipedia we debated the validity of information that anybody could edit, even altering a few pages ourselves to prove how easy it is to spread incorrect information. There were wikipedia guidelines and a process for removing false information, but it was all dependent on the community. As a result of wikipedia being self regulated,it is only as dependable of a source as it’s community. During our fake news unit, we discussed how fake news spreads similarly. Sometimes the news is propaganda and intentionally fake, sometimes the person is misguided and is creating fake news accidentally, and sometimes the news is real but is being taken out of context. And while their are journalism standards, a lot of news is created and spread by people. We talked in class about how Facebook had to revise the way it posted news because there was a viral spread of fake news stories. I realized throughout these units that people were creating a lot of fake information. Between fake standards, fake facts, and fake articles, it seemed that people were at the heart of the inauthenticity. After determining that information could be pretty much anything, and that a lot of fake information came from people, in the style of our class discussion, I asked another question; what does it mean and why does it matter? So much of our society seems to revolve and rely around information and constructs that are socially created. They fill some sort of community need, but does that mean they’re good? When Kaycie Lopez Jones came to speak to our class we talked about how media representation impacts society. She showed how the stereotypes of people of color in media can perpetuate racism and prejudice in society. Her presentation highlighted how subtle it can be, just the wording of the title or the pose on the movie poster, and how significantly that effect is. Not only does it sustain the racism in society, but it has the ability to shape how an individual sees themself. These fake ideas about people of color in the media has the power to make an impact on both a personal and public level. 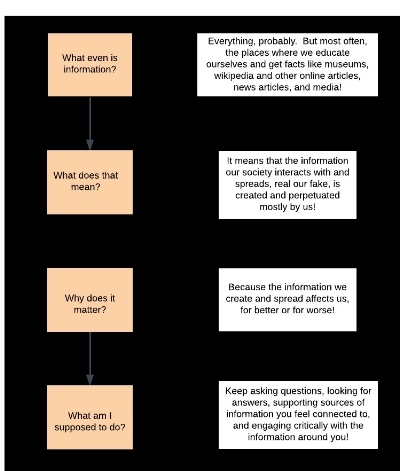 Meg's "Engaging with Information: Flowchart Edition"
This means that the information that most Americans engage with regularly, news, media, informational articles, have the power to shape society. Fake information matters because it’s forming who we are as people, and we should care because it’s not just affecting us personally but it’s affecting our communities. After realizing that information is anything we engage with, and by engaging with information we make it vulnerable to being fake, which creates a risk for the spread of false information, which has the potential to negatively affect and shape both individuals and the greater global village I asked one last question; what does that mean for me? I stress the importance of understanding how fake things can be, but what am I supposed to do about it? Thankfully, we touched on that in class too. I found hope in learning about the radical role of libraries in the resistance, exploring zines and learning about how to critically analyze articles to get the most out of what I was reading - real or fake. Figuring out what’s fake and what’s real feel important to me, it gives me something to hold on to and helps me navigate the information that's all around me. It’s constant, over-stimulating, confusing, and often I still don’t have the answers. The analysis model we used in Engaging with Information provided a structure to ask these big questions I’m often thinking about, and a way to draw connections from whatever my current philosophical crisis is to something more applicable in connection to the real world around me. This term, cohort 1 have been dreaming, being, and participating in the Futures and Citizenship core course alongside internships, independent study, and other projects. Wayfinding Academy Faculty member Sarah Iannarone led this course. This Wayfinding blog shares more about the intersection of society and self. At Wayfinding Academy, our core values are being human, welcoming adventure, and living life on purpose. In all that we do, we strive to embody these core values. We are proud of this new college we created from scratch and our alternative, intentional approach to higher education. As we near the end of our first student year, we asked parents of students in cohort 1 to share their perspective on the Wayfinding experience.